Jishin Mohan malayalam serial actor profile & biography are added here. The below article is about Jishin Mohan, who has mainly done negative roles in serials like Amala, Autograph, Amma etc. He is married to his co-artist Varada. Read on to know more about their family and about hid career life. Jishin Mohan, is an upcoming television actor. He hails from Kannur district of Kerala and was born on 3rd April. The actor has completed his schooling from Nedumgome Govt High School, Kannur. After that he completed his graduation in B-com from the University of Calicut. Jishin Mohan has worked as a Process Associate at ICICI Bank, Bangalore and then he has also served the Bangalore based company, Kristal Groups, as a Collection Manager. Demag Cranes and Components, Bangalore was his next employer. Finally he has worked with the State Bank of India, Bangalore branch as a Client Relationship Manager. Jishin has an elder brother named Jithesh Mohan who is an Umpire at BCCI Level-1 Umpire. After working in an office atmosphere for years, Jishin tried his luck in the acting industry. That was indeed a wise decision and now he is popular as a television actor. 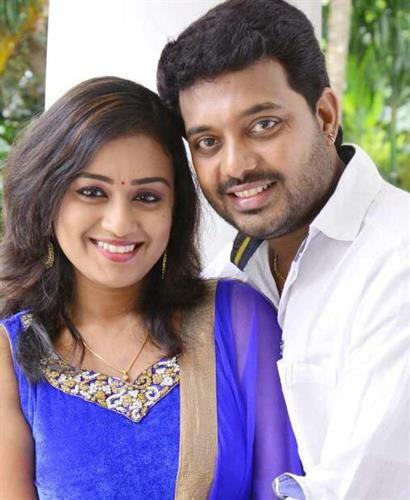 Jishin is married to Varada, a pretty serial and film actress from Thrissur. Even though Jishin belongs to an orthodox Hindu family, Varada hails from a traditional Christian family. They proved that true love is beyond caste and religion. The Mazhavil Manorama serial Amala was a real turning point in his personal life. He met Varada at the set and they soon became good friends as they had similar tastes in music. Finally the friendship turned out into love and they decided to get married. Varada and Jishin got married on 25th May 2014. It was a very simple function at the presence of close relatives and very few friends only. The reception was held at Sukritham in Chembazhanthy along with children undergoing treatment at Regional Cancer Center, Trivandrum. Now the couple is settled at Trivandrum itself. They named their new house 'Amala' in memory of the serial which helped them to meet and know each other. Apart from acting, Jishin Mohan has participated in various TV shows like "Dont do Dont do" Adventure reality show, telecasted in Asianet Plus; 'Ivide Ingananu Bhai' telecated in Mazhavil Manorama; "Smart Show" aired on Flowers Tv; 'Aarppooo Irroo', celebrity reality show telecasted in Kairali TV, 'Onnum Onnum Moonu' in Mazhavil Manorama etc. Being a celebrity, Varada & Jishin has together inaugurated Hi-end Modelling & Wedding Studio. Kattanam on 15th April 2015. In serial Jishin has mainly got negative roles but in real lief he is just the opposite. Do you know he is a pure vegetarian who has never even eaten egg in his entire life. But he has to adjust at times to cope up with the demands of his character. Jishin Mohan started his career as an actor through the Malayalam television industry. His debut serial was the popular serial 'Autogarpah', aired in Asianet. The serial was about the thick friendship of five high school students named Five Fingers and the incidents in their life. Jishin gave life to the character 'Ram' in this serial. The serial was a hit and the character Ram was a very prominent one. Ram is the villain of the serial and Jishin was capable of wonderfully performing as a villain. People started recognizing him from his very first serial itself. Ladies used to shout at him thinking that he is the actual character when they see him in train or in the shopping malls. But Jishin has taken it coolly as these behaviors of his audience shows how well the character Ram has influenced them. His childhood friend and actor Ranjith Raj was acting in the serial Autograph. As Jishin had a passion towards acting, he had asked Renjith for some roles if possible and one day suddenly Ranjith called him and asked him to send his photos to him and he consulted with his director and producer and Jishin was selected for the villain role as he had the looks. After this serial even though he became popular, the actor says that he had struggled hard to get other projects. He went and met many directors and produces requesting them to give a chance and it is his hard work which helped him reach greater heights. Another popular serial of Jishin was 'Amala', telecasted in Mazhavil Manorama. In this serial too he appeared as a villain. Varada was the central charter of this serial. Jishin gave life to he character Harish. Because of the cruelties done by Harish to Amala (Varada), the character became noticed very fast. This serial was a great success. Yet another popular serial of Jishin is 'Amma' aired in Asianet. Jishin appeared as Rahul in this serial. Rahul is a guy who has completed his studies in UK and is returning back home. A peculiarity about this character of his is that even though Rahul is crooked and cruel in the beginning, later on the character changes and he becomes a positive one. Almost all Jishin's characters were either purely negative or positive to negative characters. This was an exemption. Also his role as Rahul was well noticed and it was a character where he could bring out his acting talents to a great extent. Jishin Mohan was awarded as the best actor in negative role during Asianet television awards 2014. He as also got many more awards for this particular character. Jishin Mohan is also seen in the serial 'Sundari' as Koora Baiju. He is one of the staff in the private bus named Manikutty running in the Manjadikunnu route. Jishin has also acted in the serial 'Sarayu', directed by G. R Krishnan. Jishin who was roaming around each shooting location asking for chances is now popular and is getting roles from directors who has watched his serials. Now the crew behind the screen has trust in the actor's skills and abilities. Hence he no more has to go out asking for roles. Jishin has indeed proved himself through his hard work. The latest news is that Jishin has got couple of offers from film industry as well. The actor has once said in a interview that his ultimate aim is to appear in films. Now that he has got the chance but he does not want to reveal more about the projects as it will spoil the suspense. We will wait and see. Good Luck Jishin! Nivin Pauly malayalam film actor profile & biography are given here. Nivin Pauly is the star of Malayalam films these days. He gained popularity through the 2012 film 'Thattathin Marayathu'. Soon after that Bangalore Days, Om Shanthi Oshana, Oru Vadakkan Selfie and at last Premam also gained him popularity and fame. This article is about both the personal and career life of Nivin Pauly. It also has the list of upcoming movies of Nivin. Read on to know more. Srinish Aravind Nair malayalam serial actor profile & biography are given here. Srinish Nair or Srinish Aravind is an upcoming Malayalam television actor. He is familiar to the Malayalee audiences as 'Sharan G Menon' of the Asianet serial Pranayam. This article is about Srinish - his personal and career life.